During the weekend, we gave the dome a makeover. It is now painted and finished with stainless steel hardware. 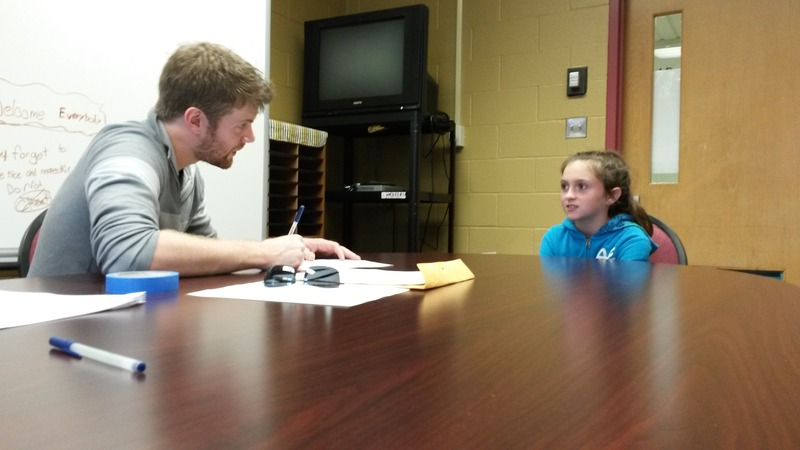 At the beginning of the week, we went to Elizabeth Forward for our final playtest of the app. Students liked it and felt that they would enjoy using it both inside and outside the Energy Lab. It was a busy week here at the ETC with the BVW festival. We were a little nervous that we wouldn’t get much traffic since our project room is the only one on its floor but to our surprise, our room was packed. We got to show off our work to many, many guests. We received an overwhelming amount of positive feedback. We even got to show our work to Dr. Subra Suresh, the president of CMU! 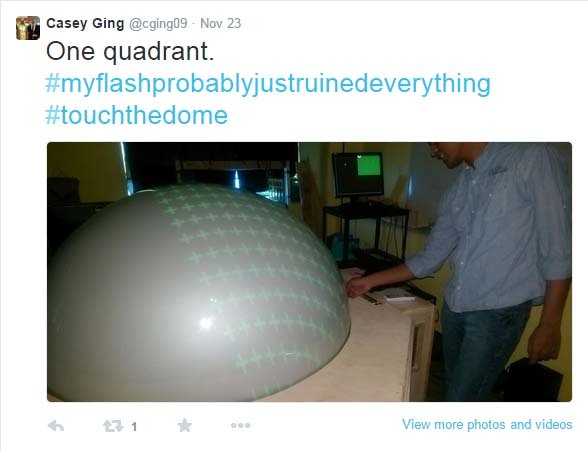 At the beginning of week 16 we were finally able to get the dome in the hands of students. Their reaction was priceless. They were so excited and got really into the game. Between games, they were huddled with their teams talking about energy and building teamwork skills. For us, this was the most rewarding part and the teachers agreed. We spent the rest of week 16 putting the finishing touches on our work and preparing for our final presentation. It’s been an awesome semester and we’ve definitely accomplished a lot. 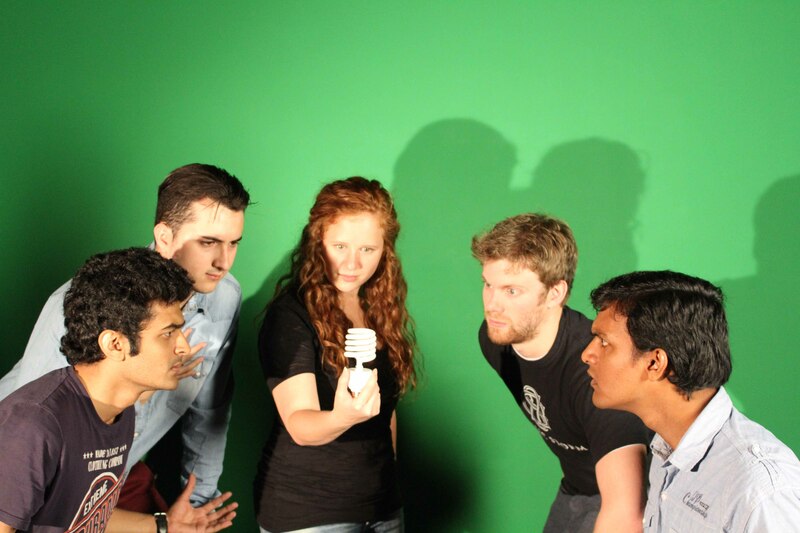 We can’t wait to watch the Energy Lab grow over the next 3 semesters. We have very exciting news! 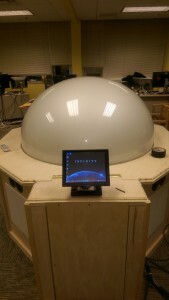 We have a fully functional touch-screen dome!!!!! We could not be more excited! We spent the weekend trying a few different ways to calibrate touch and even live-tweeted our 1024 point calibration process. We had our soft opening on Monday and it went really well. The faculty gave us a lot of good feedback and we feel confident that we will be able to wrap everything up by finals. We went through our schedule and figured out exactly what needs to be done in order to get us there. Over the weekend we worked hard to prepare our app for our upcoming playtest. We made lots of progress were really excited to get it in the hands of kids and see what they thought of it. Unfortunately, the plugins we were using wouldn’t compile properly. While it’s unfortunate that this meant we had to cancel the playtest, we’re really happy we figured this out now so that we can fix it. We worked on the app throughout the week to fix these problems. We also continued to research how to integrate YouTube into our app and concluded that it’s not possible. We removed the YouTube plugin from out app and reimplemented video-posting so that videos from any website can be posted. We added some new features to the game this week. Cities now generate periodically throughout the game in order to create new challenges and keep the interest curve moving. We continued to refine sound as well. We began working on a formal documentation book to give to our clients as well as future teams. It is important to us that we document all of our work well so that future teams can build off of it and so that it can be delivered to future clients of the project if they so choose. The exterior structure of the dome base was delivered this week which we are VERY excited about! It’s starting to look like a professional product. We’ve definitely come a long way from our initial garbage can prototype! We have soft opening on Monday and will spend the weekend polishing our work and working on touch calibration and gesture recognition. Now that most of the core game features are implemented, we are able to focus on cleaning up the UI. We worked on simplifying the UI so that the game is clean and user-friendly. Originally, we were using money to show players how many panels they could buy but realized that they were not going to do math in their head while playing the game. We decided to switch to a dot system where each panel costs 1 dot and the number of dots under a city indicates the number of panels that can be purchased. We think this will make the game much easier to understand now. We also put sound into the game; it’s really starting to come together! We sent our drawings for the exterior base structure over to the awesome Bruce Elms (aka Bob the Builder) at Elizabeth Forward and the construction of the exterior structure is underway! We took a look at the direction of our app and made some changes to make it more student-focused. Initially we had 3 tabs: video, article and free share. The students were able to comment on the teacher’s videos and articles and could share their own content in free share. We felt that this structure didn’t put enough focus on the kids’ content. In order to shift the focus, we eliminated the free share tab and are allowing both students and teachers to post videos and articles in the other two tabs. We are working hard to empower kids to learn about topics they find interesting and are very excited to be pushing the boundaries of education. We ran a very successful playtest over the weekend. The kids were excited about the game and the app and gave us some very helpful feedback. We’ll be working to incorporate it this week. We began this week by trying to find the best cameras to use to detect touch. The PS Eye cameras have a fantastic frame rate and are very affordable. Most webcams use an IR block filter to improve image quality. We’re using IR to detect touch so we have to remove that filter. We found a YouTube tutorial for how to do this for the PS Eye cameras so we picked up a few to test out. After hours in the shop and a few broken lenses, we realized that the cameras we had were a newer model that had the IR filter sandwiched between two lenses which meant we couldn’t remove them without destroying the cameras. We decided to go back to the Microsoft cameras we had been using even though the framerate wasn’t as good. We then began to tackle the challenge of reading input from four different cameras. We realized that this was not possible with Reactivision and switched to CCV. We were successfully able to read input from 4 cameras at once and confirmed that this does allow us to read input from the whole dome! The interior structure for our dome arrived this week. This will help us as we continue to work on calibrating because it greatly improves the stability of our system. We made some modifications to it and are working on the design of the exterior . The game has proven to be much more challenging than expected. Implemented a design on a sphere is not straight forward and we’re working hard to ensure that we understand how to do it properly so we can make it easy for others in the future. We put together a detailed design document to eliminate any confusion and help the process move forward. We began working on sound design and are excited to add this element to the game. Towards the end of the week, many guests stop by our project room to look at our work. It’s always exciting to show our work to new people and their reactions fuel us to keep working hard. We began this week by taking a close look at our project’s schedule. We realized that while we have accomplished a lot already, there is still a lot of work to do and we need to pick up the pace if we want to do our best. We decided that the best way to do this is to add more core hours. When we’re all here together, we can help each other out and give each other immediate feedback which results in a much faster development process. We also decided to stop using a regular scrum board and use Trello. Trello’s filters allow individuals to use the team’s task list as their own personal to-do list. So far, this has resulted in better task-tracking and has increased our efficiency. We went to Elizabeth Forward on Monday to playtest our app again. The playtest went really well and the kids understood this iteration of the app much better than the previous one. The presentation of the competition was a little confusing to them and we are spending this week working on improving that feature. We were finally able to take a look at our game on the dome this week and realized that the different elevations of terrain were not reading well on the dome. We decided to scarp this feature and the game now looks fantastic. We continued to implement game features in preparation for our upcoming playtest. Players can now place cities on hexes and connect them to solar panels. The light from cities throughout the night depends on how much energy they’re getting from solar panels which in turn depends on how much energy the panels were able to harness during the day. We continued to work on touch this week and have made a lot of progress. The software is registering touch outside of the bottom few inches of the dome. We can design around this for our game but want to ensure our platform is as robust as possible. Our next step is to try to use multiple cameras to detect touch. The biggest hurdle here is figuring out how to detect input from two cameras on Windows. This was a really productive week for us and we can’t wait to see what’s next. We spent most of our time at the beginning of this week polishing our halves presentation. We presented on Wednesday and are happy with how it went. Several client representatives came and it was great to be able to show them the progress we’ve made. 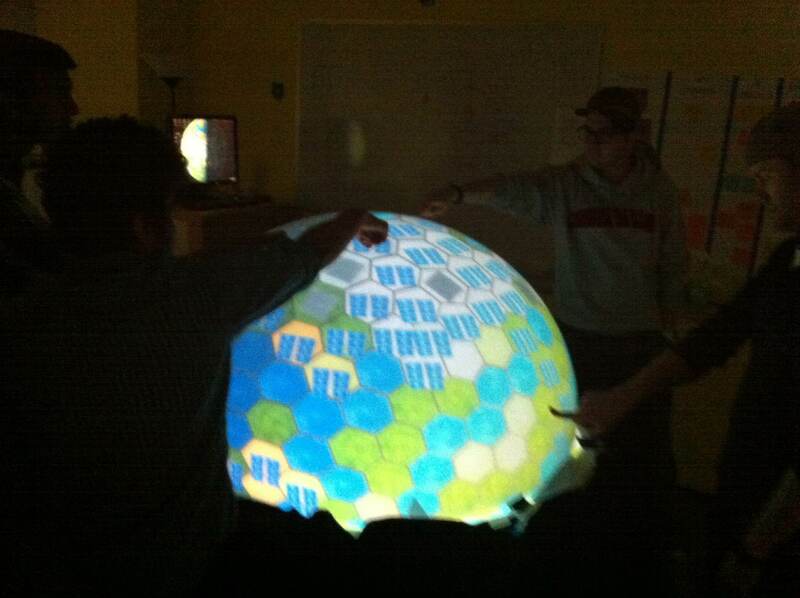 Now that the dome projection is working we are able to start working on touch. It took a few tries but we have successfully gotten our camera to pick up touch on the dome. It’s not perfect yet; we still have to figure out the best way to light the dome, the optimal camera position, and how to reduce noise, but we are confident that we will be able to accomplish this. Now that we have tested our current set of wire frames for the app and know we are going in the right direction, we are able to start working on gamification of the app. We are working on a scoring system to allow the students to level up as they learn more about energy. We will be going to Elizabeth Forward on Monday to playtest the app again. We have been working with “Bob the Builder” aka Bruce from Elizabeth Forward on the construction of the base for our dome. Bruce made some suggestions for small changes to the design of the base that will allow us to easily place our projector in a location that will give us a big enough image. We’re really close to having a fully functional touch screen dome and are so excited! This was a big week for Team infinitE! 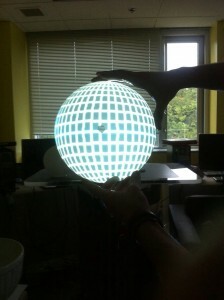 We finally figured out what tools we will use to create our hex sphere. We are creating the sphere in Houdini because it is the only tool that allows us to easily adjust the parameters that are important to our game. However, Houdini does not create UVs for the hexagons so we will use blender to create those. We are excited to move forward with our game. We ran a playtest this week to ensure that the features we have implemented in our app are simple and intuitive. We were very excited with the results of this playtest; the kids all understood how to use the app. They even understood features, like QR codes, that they had no seen before. We started working on our halves presentation this week. The whole team got together to figure out the flow of our presentation and who will say what. We have started getting our slides together and had our first practice in the RPIS. We’re now in the process of making our slides look awesome and are continuing to prepare our presentation for next week. And finally, the big news. THE DOME IS HERE! We are so excited! It arrived on Friday. We stayed late Friday night and worked all day Saturday to get the projection up and running. Since we have to bounce the image off of a mirror, we had several parameters to figure out. We need to make sure that the projector is as close to the dome as possible to minimize the distance the kids will be from the dome. This is our dome. We couldn’t be more excited to show it to everyone! While waiting for the dome to arrive, we are trying to get as many questions answered as possible. This week we are trying to figure out if we need a front-surface mirror and how much one will cost. We’ve contacted several companies and are still on the hunt for a front-surface mirror within our budget or another solution. 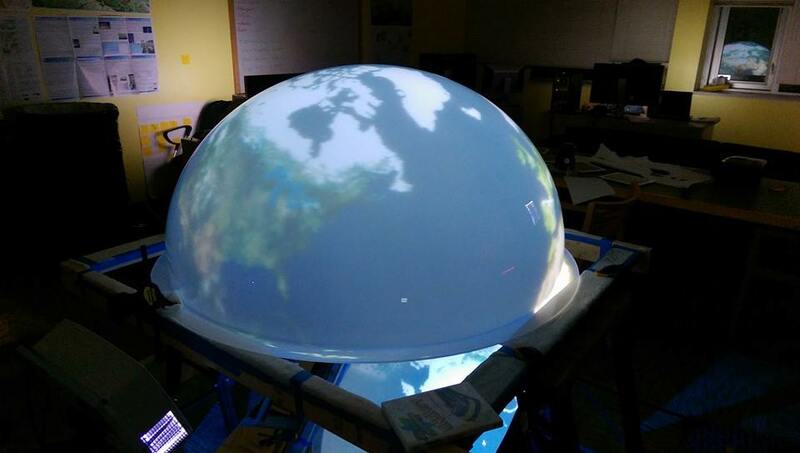 In order to turn a regular acrylic hemisphere into a projection screen we are coating it with a special type of paint called rear projection screen goo. We got our test piece painted this week and the image looks great! We have begun conversations with fabricators and are in the process of figuring out who will make the base for our dome and what it will be made out of. There are a lot of choices here and we need to find the one that best suits the needs of our clients and the project’s budget. We have made great progress on our iPad app. In order to ensure that our app can be used on other platforms we are creating it in Unity. This will be more challenging than making the app in XCode but it is important that it is compatible with hardware that other clients have. In order to accomplish this we have been looking into Unity NGUI. We are also finding ways to integrate YouTube into our app. Our game takes place on a hex sphere with different hexagons representing different types of terrain. We want to procedurally generate these to keep the experience new and exciting each time. There are several ways to accomplish this. We are looking into some combination of using Houdini, Blender and Maya and are exciting to find a solution and begin implementing other features. We began week 5 with our quarters presentation. We got a lot of great faculty feedback with the majority of it surrounding the fact that this is a two-year project. The faculty was curious as to how we are handling this situation and how much planning we are going to do for future teams. We decided to talk to our clients and clarify the goals of the project and the purpose of the Energy Lab. Not only will this information be useful for future teams but it ensures that our work is on the right path and that it will be relevant to future teams. We also need to make sure we have great documentation. We settled on a projector that best-balances all of the parameters we’re looking for. Once it arrived we were able to grab a 48” x 48” canvas from the shop to start setting up our projection. 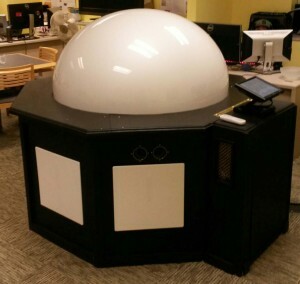 The challenge here is that the projector will be in a table underneath the dome and the whole structure needs short enough for 6th – 8th grade students. We found a configuration that works and are excited to get the actual dome so that we can get exact measurements. We began working on a prototype for our first game on the hemisphere. The game environment is a sphere comprised of procedurally generated hexagons that will resemble different types of terrain. Students will have to place solar panels to power cities and ensure they have enough power to last throughout the night. The game is in great shape and is moving along nicely. We worked on the backend programming for the app and made a “fake” interactive version of it to use for playtesting in the meantime. At the beginning of week 6, we went out to Elizabeth Forward Middle School to playtest the app, see what the kids thought of our prototyped hemisphere, and ask them general questions about their education. Kids are the best playtesters because they don’t hold back at all! We learned that our app needs to be a little more directed and concise. The students told us about some apps that they are familiar with. Looking at these apps will help us get an understanding of the types of interactions the students are used to. On Tuesday, we had the opportunity to meet with Mary Murrin and Lee Ann Wainwright from Chevron as well as Linda Marcolini from Beth-Center and get their feedback on our work. Everyone was on board with our ideas and excited about the direction we’re going in. On Wednesday, we met with teachers Mike Baer and Paul Callaghan from Elizabeth Forward as well as Tait Klein and Gene Fox from Beth-Center. The purpose of this meeting was to get a sense of how they will use the Energy Lab and where it fits into their curriculum. For most classes, the teachers will use the Energy Lab in any way that it fits into their curriculum. Mike and Paul intend to use it extensively for Elizabeth Forward’s rotation science class for 7th graders. We also got a sense of how the teachers already incorporate technology into their classes and why they find it useful. We will keep all of this information in our minds as we move forward. Casey and Lisa set off to Sarasota for the rest of the week to attend the SATE conference. They got to speak with several interesting people in the industry about team infinitE’s work and got some great feedback. The rest of the team continued to work hard and move forward. 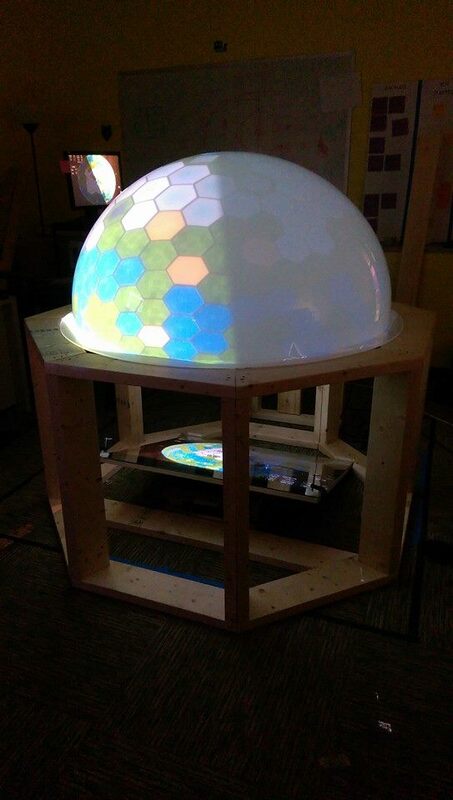 With our dome on its way and our app in its second iteration we have a busy few weeks ahead of us! Our goal for this week was to prove to ourselves that our tech works and to put a bigger focus on the incredible learning potential of the app we’re making. With so much interesting research going on to figure out how to make an interactive hemispherical display we have had to remind ourselves that we are also making an app. The app is where kids get to take ownership over their own education and where the Energy Lab comes together. In the app, students will be able to post related articles or videos on a forum and we decided that we should start doing this within the team. This will ensure that it’s actually fun and interesting but will also make sure that those who aren’t working on it are still thinking about it. Our UX designer has come up with some great wireframes for it and we’re excited to begin playtesting it next week. Our programmers continued to research the two big tech questions that were brought up last week and made significant progress. 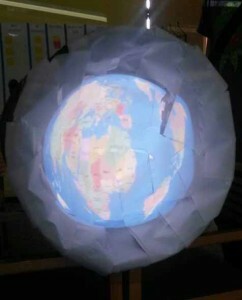 We looked into different methods of projecting onto a sphere. We investigated Unity wrappers and fancy lenses but ultimately realized that we could solve this problem with design. We will constrain ourselves to designing on a sphere in Unity. At first this seems like it will significantly limit our design however we are designing for a physical hemisphere so it will make designing much more intuitive. 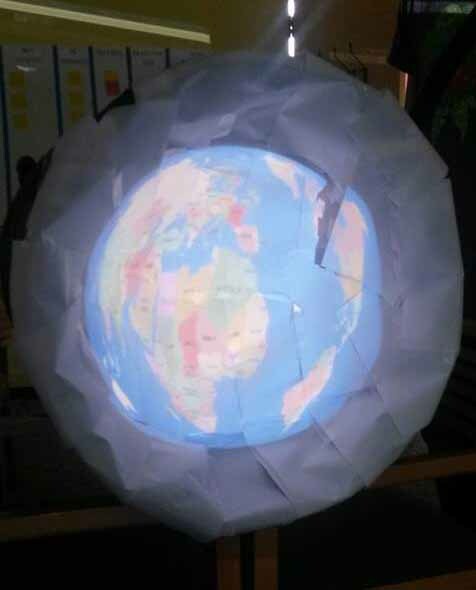 We are still unsure of what the effect of projecting into a dome will be on the focus of the image and are anxiously awaiting the arrival of the hemisphere and projector so that we can investigate this question. We achieved functionality of two potential input methods on a flat surface: fiducial trackers and direct touch. The fiducial trackers are not as intuitive to use as direct touch but do provide the benefit of being able to individually identify each student. As with all things, there are pros and cons to each of the input methods and we have to figure out which one works best for our purposes. The next step here is to achieve the same functionally on a hemisphere. 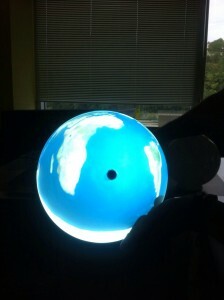 The hemispheres are on their way and have been generously donated by Jim Slovonic, the CEO of BAW plastic. Thank you Jim! We are excited to have answers to our big tech questions and can’t wait to begin creating content. We met over the weekend and made a lot of progress. We began week 3 by clarifying what was expected of us in terms of deliverables and narrowed down our focus. We decided that we will create an app that will tie the whole experience of the Energy Lab together as well as the center piece for the room and content for it. We think that focusing on these two pieces will allow us to set a good foundation for future teams to work on the Energy Lab while making it fun and interesting to use by the end of this semester. The app will coordinate the entire Energy Lab through a competition. All classes who use the Energy Lab will be divided into 4 teams and each team will be given its own world. Through interacting with different energy stations around the room, students will be able to generate energy for their worlds. Students can continue learning outside of the Energy Lab and post anything energy-related on a forum and further benefit their worlds. Since the sun is the center of all energy, we decided to build an interactive hemisphere to represent the sun in the center of the Energy Lab. The hemisphere’s content can change so it will also be able to feature different worlds from the competition and other energy-related content. This brought up two big research questions: how do we project into a hemisphere and how do we make it interactive? We split up our work among the team so that we could cover as much ground as possible. Juan began working on wireframes for the app. Casey worked on the design of the hemisphere. Adarsh began researching different ways to achieve a touch interface on the hemisphere and Jimit looked into the projection. We set up a “paper” prototype and have made a lot of progress on these topics. We are excited to keep working on them and are enjoying the challenge! We spent the majority of this week doing research and brainstorming. We met on Wednesday to discuss our ideas as a team. The majority of our attention was focused on figuring out the overarching theme for the experience we will be creating and what we can build physically to act as a centerpiece for the experience. We have several ideas on the table ranging in scope and flashiness. Our biggest hurdle here is scaling down our imaginative ideas to be attainable within our timeline and budget. We’ve settled on having an experience that involves multiple stations so that we can showcase different types of energy. We’ve decided that the best way to figure out what the theme will be is to first look at what these different stations will be and particularly what the students will be doing at them. We are having a brainstorming session on Saturday to figure this out and will then revisit our theming ideas, or perhaps come up with new ones, to fit the ideas we have for stations. Our goal is to have a few concrete ideas to pitch to our client on Monday. We took some time away from brainstorming to take our team picture this week. We decided we would either have a Buzz Lightyear themed picture or one with light bulbs and took pictures for both. Lots of Photoshop will be needed. 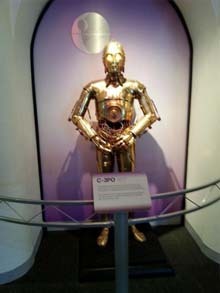 On Friday we went out for lunch as a team and then went to the Carnegie Science Center to get some inspiration. 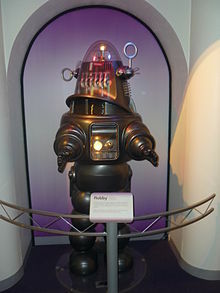 We saw many interesting exhibits and a few familiar (robot) faces. We are excited to finish brainstorming this weekend and begin prototyping next week. We started off this week by picking a team name. 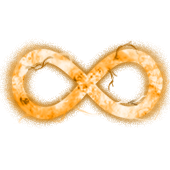 We had some awesome suggestions and ultimately settled on infinitE (pronounced like infinity). The goal of our project is to teach middle school students about both fossil fuels and alternative energy sources with an emphasis on transitioning towards alternative sources. If harnessed correctly, it is possible to have energy for as long as the earth will exist which, from the human perspective, is an infinite amount of time. We chose infinitE as our team name because it reflects this idea. We went to Elizabeth Forward School District on Friday and had a very successful first meeting with our clients. They have lots of interesting ideas that tie in very nicely with our own preliminary ideas. Our clients gave us a tour of the space that we will be working with, which was very helpful. Upon leaving Elizabeth Forward we were all very excited. The car ride back to the ETC was buzzing with energy and ideas. We will be spending the first part of week 2 doing research individually and will put it all together towards the end of the week. We are so excited to move forward with this project and can’t wait to see what we come up with.